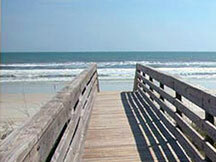 Our oceanfront rates are one of the most competitive in the St. Augustine. Shop around and find out why! 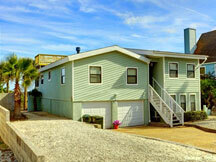 5224 Atlantic View is a non-smoking, pet friendly, 4-bedroom, 3 full-bathroom oceanfront single-family home. 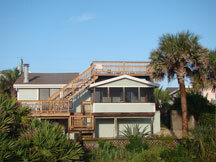 It is located directly on the beach in St. Augustine Beach and accomodates 12 people. 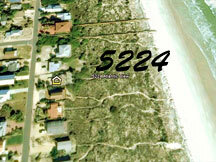 The street is a quiet, residential side street situated 3 blocks east of busy A1A (click on "Map Location"). The neighborhood consists only of single-family homes. 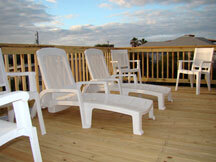 Our home features large oceanfront decks and direct views of the Atlantic Ocean. Central A/C and Heat and Ceiling Fans * 3 Large Deck Areas including one Screened-In Deck Porch and one Rooftop Deck * Many Deck Chairs * Non-Working Fireplace * 5 Flat-Screen HDTVs * Comcast High-Speed WiFi * Washer-Dryer, Dishwasher, Microwave, Coffee-Maker, Blender * Beach Chairs and Toys * Garage "Game Room" with Ping Pong Table and more! Although there is a path to the beach from our back yard, we discourage its use. 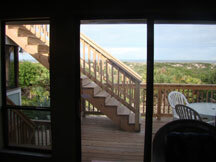 This is a heavily vegetated area and the ocean is approximately 200 yards from the property. There is much visible wildlife on this dune, including rabbits, box turtles, cats and sea turtles. We do not recommend crossing the dune from our back yard. 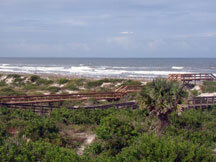 The dune area is a federally protected zone and signs posted on the beach prohibit walking directly on the dune. HOWEVER, there is a VERY convenient township walkway located only 2 doors down (100' to our north). This makes walking over the dune much easier, safer and also legal! We strongly recommend using this convenient walkway. Please see pictures above. Master BR (on left) features a King and its own bathroom. The 2nd and 3rd Bedrooms shown above share the 2nd Bathroom off of a common hallway. Each of these two BRs features a Queen bed. 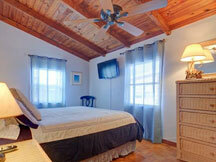 All Bedrooms have 37" flat-screen HDTVs, plenty of furniture and full closets. Access to the 4th bedroom is via the back stairway. 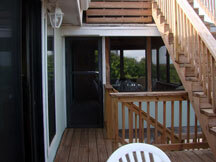 The back deck has a well-lighted stairway going down to a hallway off of the garage, which leads to the 4th Bedroom. 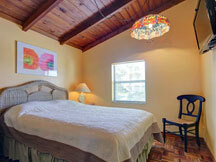 This Bedroom features its own full Bathroom and has two Twin beds plus a Pullout Sofa, accomodating a total of 4. There is also a Pullout Sofa in the LR, so the main level will sleep 8 and the 4th Bedroom accomodates an additional 4, for a grand total of 12 people. 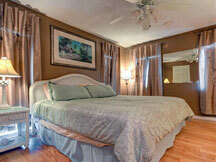 Our home is an easy 5-minute drive to major supermarkets, restaurants and St. Augustine attractions. Downtown St. Augustine is 15 minutes by car. Click on our "Map Location" link (above left), then click on "View on Google Maps" and then "Search Nearby" and enter whatever you're looking for (pizza, for example). Whatever you're looking for, we're nearby! 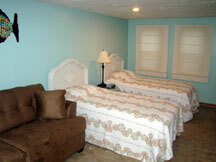 Move-in ready, freshly-made beds topped with bed spreads, including freshly laundered sheets and pillowcases. You'll also have clean bath and hand towels, wash cloths, an initial stock of soap, cleaning supplies, paper products and a fully stocked kitchen. 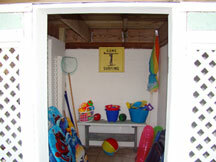 Our outside "Beach Shack" also contains a small number of beach chairs, boogie boards and beach toys! Nothing to do but bring in your luggage, put on your bathing suit and go to the beach!